An allegedly-intoxicated driver crashed down an embankment after trying to evade a pursuing sheriff's deputy Saturday night. 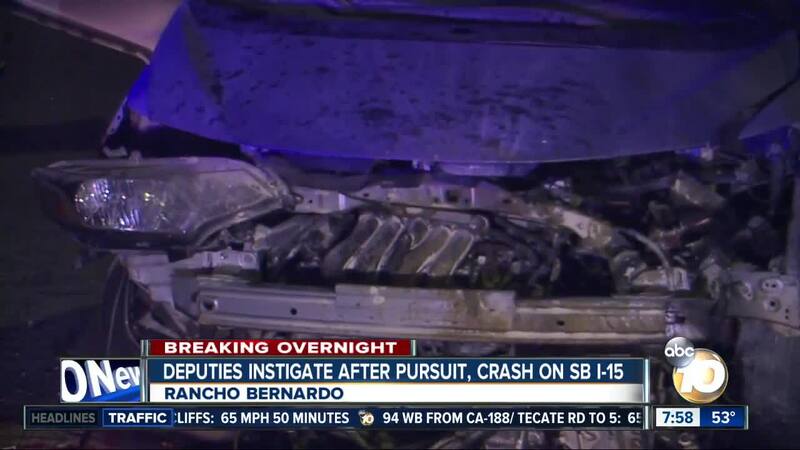 SAN DIEGO (CNS) - An allegedly-intoxicated driver crashed down an embankment after trying to evade a pursuing sheriff's deputy Saturday night. It all started around 10:15 p.m. when a deputy heading south on Interstate 15 noticed a car speeding near the Deer Springs Road exit, according to San Diego County Sheriff's Lt. Dave Perkins. A short time later, the deputy tried to pull the car over, but the driver refused to stop. The deputy chased the speeding car through Escondido and into San Diego until the driver, who was in the HOV lanes, got back into the general-use lanes near Bernardo Center Drive and failed to negotiate a curve, sending him tumbling 30 feet down a ramp, Perkins said. Paramedics took the driver, identified only as a man, to a local hospital, and he was later arrested on suspicion of evading a peace officer and driving under the influence, according to Perkins. The three left lanes of southbound I-15 were blocked off near the crash scene shortly after it happened and were re-opened around 12:30 a.m., according to Caltrans San Diego on Twitter.